You’ll recall how An Taoiseach Enda Kenny vehemently defended the Irish corporate tax rate in the face of flinty pressure from the French president Nicolas Sarkozy and less-obviously, from the German chancellor Angela Merkel in March 2011. There was the famous “Gallic spat” and the result of that was that Ireland missed out on an interest rate reduction on its bailout for another four months. When the interest rates were eventually reduced, the reduced rates applied to all bailout funding but the interest rate wasn’t back-dated – that “Gallic spat” cost us over €10m. Ireland has an established global tax brand, it’s 12.5% and it’s not changing. This attracts colossal foreign direct investment by companies who want to exploit the low tax rate. For example, Google books half of its global revenues through its offices in Dublin. In 2011 Google Ireland booked €12.5bn of revenue and booked a gross profit of €9bn. It paid just €8m in corporation tax. This has less to do with Ireland’s 12.5% standard corporate tax rate than with the ability of global companies to have discretion in where they ultimately book profits. But you might also recall that in the recent bailout discussions for Cyprus, a country which has an even lower headline corporate tax rate of just 10%, that Cyprus is being forced to raise its corporate tax rate by 25% in relative terms, from 10% to 12.5%. This change is supposed to improve Cyprus’s economy which, like Ireland’s, also depends on foreign direct investment. So, why are Cyprus’s friends in Europe forcing it to increase its corporate tax rate, when such an increase is anathema to Ireland? But if that is the position in Ireland, why is it not also the position in Cyprus. Has Ireland overestimated the contribution to the well-being of our economy of foreign direct investment and its relationship with our tax rates, or are the Cypriots just too dumb to understand how their economy will suffer as a result of tampering its rates. Surely, only one answer is correct. Deputy Joe Higgins: asked the Minister for Finance the amount of additional revenue that will be raised for the Exchequer if the corporation tax rate here was raised by the same proportion, that is by 25%, as the increase to the Cypriot corporate tax rate in the original Cypriot bailout plan of 16 March 2013. Minister for Finance, Michael Noonan: I am informed by the Revenue Commissioners that the full year yield to the Exchequer, estimated in terms of expected 2013 profits, of increasing the standard rate of corporation tax by 25% from 12.5% to 15.6%, is tentatively estimated on a straight line arithmetic basis to be about €928 million. While this estimate is technically correct it does not take into account any possible behavioural change on the part of taxpayers as a consequence. In terms of an increase in the 12.5% rate, estimating the size of the behavioural effects is difficult but they are likely to be relatively significant. An OECD multi-country study found that a 1% increase in the corporate tax rate reduces inward investment by 3.7% on average. On this basis, it would take only a 2.5% increase in the rate (to 15%) to decrease Ireland’s inward investment by nearly 10%. This assumes the average applies across the board but in fact the effect is likely to be more extreme for Ireland. The very major importance of maintaining the standard 12.5% rate of corporation tax to Ireland’s international competitive position in the current climate must also be borne in mind. Ireland, like other smaller member states, is geographically and historically a peripheral country in Europe. A low corporate tax rate is a tool to address the economic limitations that come with being a peripheral country, as compared to larger core countries. Ireland’s low corporation tax rate plays an important role in attracting foreign direct investment to Ireland and thereby increasing employment here. Recent research by the OECD also points to the importance of low corporate tax rates to encourage growth. Further, it would be difficult to justify such a move in the context of Ireland’s stated position that we will not change our corporation tax strategy. Even a marginal change would undermine both our long held stance on this issue and the certainty of business, domestic and international, in our resolve to maintain that position. The McKillen story – which appears to have died away completely – was about information released to businessman and developer Paddy McKillen by the Department of Finance under Freedom of Information. Emails between the Secretary General of the Department, John Moran to a representative of Paddy’s rivals, the Barclay brothers, showed the Department had communicated with the Barclays about Paddy’s loans, but really didn’t show very much, with the Department referring the Barclays to IBRC, though Paddy’s camp picked up on an email from the Barclays thanking the Department for its – unspecified – support. The Department denied it did anything improper and finance minister Michael Noonan has backed the Department. 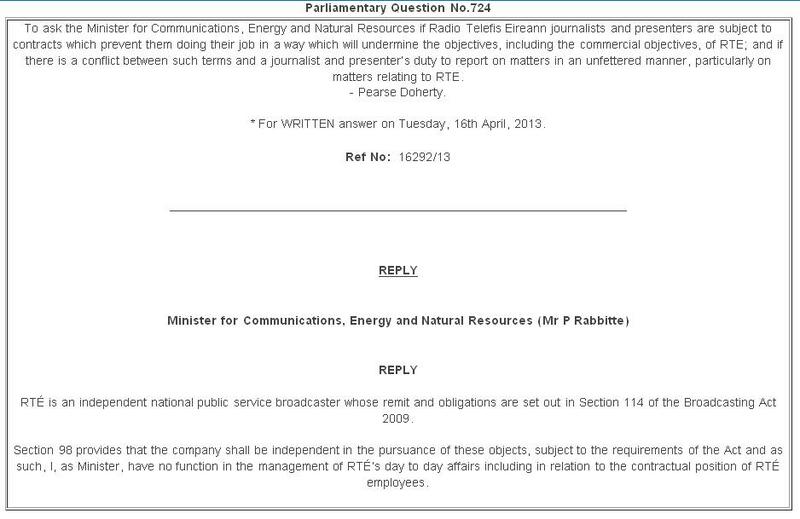 And you thought Minister Pat Rabbitte had responsibility for RTE? 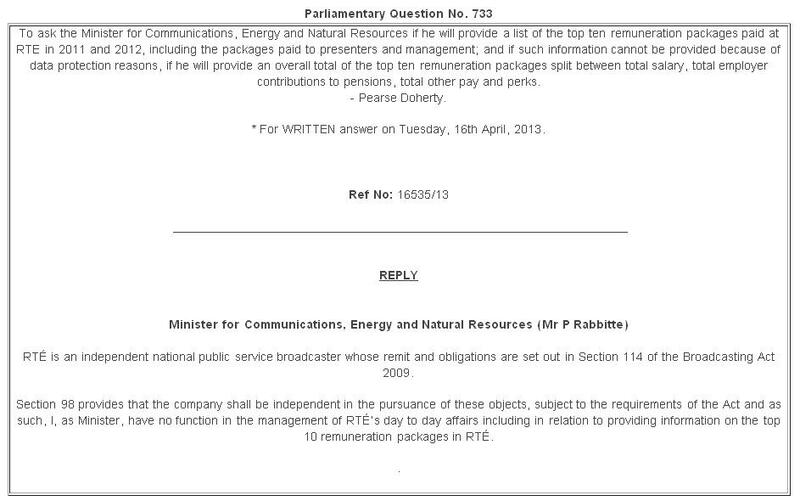 Just to mark the appearance of Minister for Communications, Energy and Natural Resources Pat Rabbitte – pictured above, right – on the radio show of the €295,000-a-year Marian Finucane this morning, here are some parliamentary questions responded to by the Minister this week. Two recent events have shown us just how much this State might have saved if these issues at the heart of these protests had been recognized by the decision-makers in government. In February 2013, we liquidated Irish Bank Resolution Corporation which will now see a small number of bondholders, estimated on here to be €100-200m burned, though it will also see credit unions losing €15m and Irish pension funds losing €1m. When this government came to power in 2011, there were nearly €4bn of senior unguaranteed bonds at IBRC alone, and practically all have now been 100% repaid. You might recall the protestations at these repayments, here was the scene in the Dail in November 2011 when a USD 1bn bond was being repaid at Anglo, Sinn Fein and most of the Independent deputies walked out in protest. The second event was the bailout of Cyprus where we saw that Cyprus itself made the decision, rubberstamped by the Europeans, to burn depositors with deposits less than €100,000 even though they were guaranteed, though that decision was later reversed by the Cypriots themselves. We were also reminded that sovereign EuroZone countries still retain fiscal powers and can levy taxes, so we’re now scratching our heads as to why this Government didn’t introduce a 100% tax on unguaranteed senior bondholders when it came to power in March 2011. In the Dail this week the Sinn Fein finance spokesperson Pearse Doherty asked Minister for Finance Michael Noonan to confirm the senior bondholders in Irish banks when he came into office and also why he didn’t impose large taxes on payments to such bondholders. Judge the responses below yourself, but they just appear to show how stupid we have been and how we have let billions slip through our fingers which we will be repaying for decades to come. There are still some meaty bonds left at AIB, PTSB and Bank of Ireland but the bulk of the easier-to-burn bonds have been repaid. The Ballyhea protesters will shortly be updating their demands and focusing on the €25bn of sovereign bonds given to the Central Bank in February 2013 as part of the IBRC liquidation, but when the story of this phase in our State’s history is written, the Ballyhea protesters and those like them will be seen as prescient and engaged, contrasting with ignorant and incompetent government which could have liquidated IBRC in March 2011, and which could have used its sovereign fiscal powers to impose taxes on bondholders at other banks in receipt of bailouts. Deputy Pearse Doherty: To ask the Minister for Finance if he will provide an assessment of the overall cost to the State of the bailout of Permanent TSB; if senior bondholders had been wiped out in March 2011. Deputy Pearse Doherty: To ask the Minister for Finance if he will provide an assessment of the overall cost to the State of the bailout of Anglo Irish Bank and Irish Nationwide Building Society, if senior bondholders had been wiped out in March 2011. Deputy Pearse Doherty: To ask the Minister for Finance if he will provide an assessment of the overall cost to the State of the bailout of Allied Irish Banks and the Educational Building Society, if senior bondholders had been wiped out in March 2011. Deputy Pearse Doherty: To ask the Minister for Finance further to Parliamentary Questions Nos. 179, 180, 188 and 227 of 26 March 2013, to which he, in part, responded the Eurogroup advised against this proposal, but it recognised that fiscal measures such as taxes and levies are matters for individual member states, whether in a programme of assistance of not, if he will provide an assessment of the benefit that would have flowed to the State if a 99% tax or levy had been imposed on senior unguaranteed bondholders in Anglo Irish Bank and Irish Nationwide Building Society from March 2011..
Minister for Finance, Michael Noonan: I propose to answer questions 219, 220, 221 and 250 together. The Deputy will be aware that when this Government took office it attempted to enforce burden sharing with senior unguaranteed bondholders in particular institutions that were no longer core elements of the Irish financial system. Intensive discussions were held with our European partners and particularly President Trichet of the ECB in the run-up to the announcement of our stress tests on 31st March 2011. At that time the President believed that such action was not in the interests of Ireland or the Euro Area. This matter was discussed again with President Trichet on a number of occasions including the Ecofin meeting in Poland in September 2011. The Central Bank of Ireland has advised me that as of 18th February 2011, the total unguaranteed senior debt issued by the covered institutions was €36,452m of which €20,039m was unguaranteed senior secured and €16,413m was unguaranteed senior unsecured (This information was published to the Central Bank of Ireland website in April 2011). Within these figures, the amount outstanding at Anglo Irish Bank and Irish Nationwide combined was €3,748m (unguaranteed senior unsecured), while there was no senior unguaranteed secured notes in issue. As the Deputy is aware, burden sharing was thus restricted to junior debt, which over the course of the crisis contributed over €15bn in capital to the Covered Institutions. It must surely strike most people as odd that, as part of the forthcoming personal insolvency arrangements, the names, addresses and dates of birth of those availing of the arrangements will be a public document, whilst at the same time, the State writes off billions in debt owed by wealthy individuals and companies. Take Thomas Crosbie Holdings (TCH), the media group which publishes newspapers like the Irish Examiner and Sunday Business Post and operates local radio stations. The bulk of this company was sold in a so-called “prepack receivership” in March 2013. The buyers were two of the Crosbie family, Tom and Ted, which controlled the original Thomas Crosbie Holdings and the business wasn’t placed on the open market and many smaller creditors weren’t consulted. Another part of the original group which includes the Sunday Business Post was placed in examinership and the betting is the Crosbies will buy this part also, though as a minority part of a consortium which will be controlled by the Irish Times. We don’t have precise accounts for TCH just before the events of March 2013, but it is understood it owed AIB about €28m. We, that is, the State, owns 99.8% of AIB and we have shoveled €21bn into AIB/EBS to bail it out. We also don’t know what writedown was given to TCH as part of the receivership and which will be given to the lump in examinership, but the likelihood is that is will be over €10m. So, if you are a Merchant Prince who has undergone a process which has cost the State millions, you escape any naming-and-shaming and indeed, in time, you get to boast how great a businessman you are for restructuring your debt after disastrous decisions to expand during the 2000s. But, if you have a €300,000 mortgage with Ulster Bank which relates to a property that is now worth €200,000 and you enter into a six year personal insolvency arrangement and pay back €60,000 during this time and at the end of the six year period, you get a debt writedown of €40,000 then your name will be immortalized in a public register. And you haven’t cost the State a cent because Ulster Bank is not financially supported by the State. Yet, having likely cost AIB millions, the Crosbies are Jack-the-Lads. Separately, NAMA has said that it will work with certain developers over a period of years to see their debts reduced, but that when it is satisfied with the compliance of the debtor and that all assets have been accounted for, it may write off debt. These will be developers with personal liabilities, perhaps as a result of providing personal guarantees. But again, there will be no public register of such individuals who will have millions, if not billions, written off. And again, written off with a direct cost to the State. During the week, the Sinn Fein finance spokesperson Pearse Doherty asked Minister for Finance Michael Noonan about the debt write-off at AIB, and you won’t be surprised that Minister Noonan claimed “data protection”. And for interest, the enterprise minister, Richard Bruton was asked about pre-pack receiverships and said concerns about the process were being considered by his Department. The questions are below, but it seems “data protection” won’t protect the hoi polloi in the forthcoming personal insolvency arrangements. Deputy Pearse Doherty: To ask the Minister for Finance if he will confirm the sum owed by the Thomas Crosbie group to Allied Irish Banks, in which he owns 99.8% of the shares, immediately prior to the receivership and examinership of companies within the group in March 2013; and if any write-down of debt has been provided to the group as part of the group’s receivership and examinership. Minister for Finance, Michael Noonan: The Bank has informed me that due to data protection rules and confidentiality AIB is not in a position to discuss details of individual customer circumstances. Deputy Pearse Doherty: To ask the Minister for Jobs, Enterprise and Innovation his plans to examine the so called prepack receiverships to address concerns that companies are being bought out of debt by their existing owners, with limited marketing of the business to other potential buyers, whilst smaller creditors are being excluded from the process. Minister for Jobs, Enterprise and Innovation, Richard Bruton: At the moment, my immediate priority in the company law area is to work for an early enactment of the Companies Bill 2012, which was published on the 21st of December last and is due to begin its passage through this House next week. Once on the statute book, the Companies Bill will introduce a modern company law code for Ireland and bring significant benefits to business. The Bill has been many years in the making and I am keen now to have it in force at the earliest opportunity. However, I am aware of the issues that the Deputy has raised with regard to the conduct of receiverships and I have asked my officials to give them consideration.